Here at team Just A Card we are so excited, as our biggest campaign push to date is coming up this weekend!! We’ve been shouting about it for a while, but in case you missed it during the Christmas induced Quality Street coma, we’ll be at the UK’s leading international trade show for design-led lifestyle brands, Top Drawer from Sunday 14 to Tuesday 16 January! The amazing team at Top Drawer and the Greetings Card Association (GCA) have joined forces to support the Just A Card campaign by providing us with a free stand in the Paperfest area of the show, and we really can’t thank them enough for supporting us in this way. 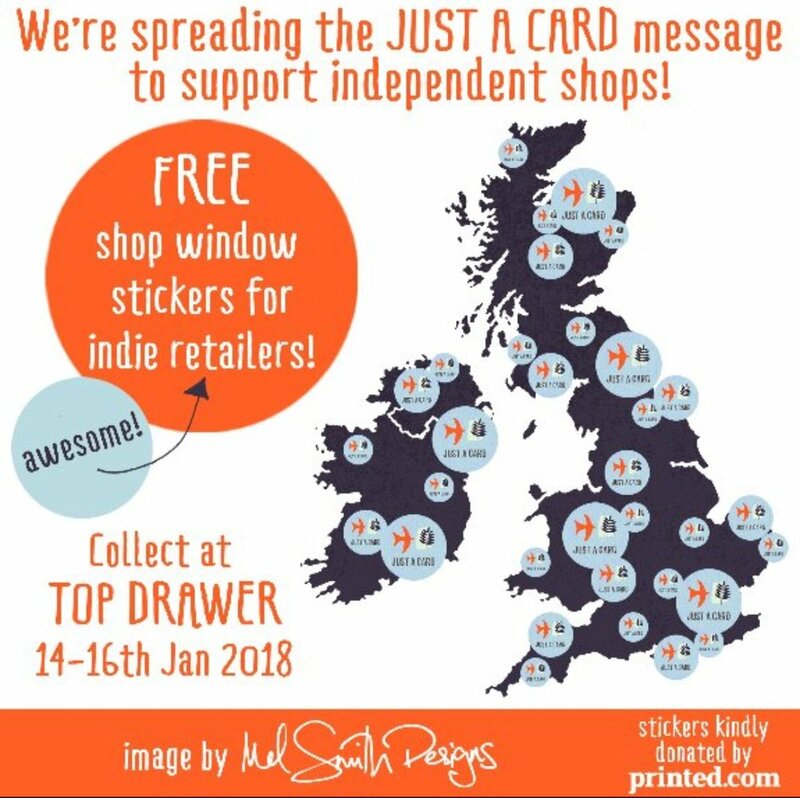 Not only this, but the team at printed.com have helped us to realise a long held dream to get Just A Card into the windows of independent shops across the country, by donating a supply of gorgeous window stickers and leaflets, which we will be handing out free of charge (while stocks last!). Do head over to printed.com’s site to see the amazing products they have on offer. Whether you have a stand of your own at Top Drawer or are attending as a buyer or from the press, please come along to our stand to meet the team. Every single volunteer member of the Just A Card team will be there at some point over the three days of the event, and we can’t wait to meet you all! Those of you with shops who are readers of Progressive Greetings Magazine, will almost certainly have seen that we’re the top story in their news section this month, so a big thank you to them for helping to get the word out there as well. So all that’s left to say is come and see us over the weekend if you can! If you’re unable to make it to Top Drawer but would like a window sticker for your shop, Michael Fram of Leaping Hare Gallery & Framers will very kindly be on post duty again after the event to send them out to those shops who’d like them. Details of how to do this will follow shortly. Thanks again to Top Drawer, the GCA and of course printed.com – here’s to the biggest and best year yet for Just A Card!